According to a Develop survey, 30 percent of game developers claim Nintendo guru Shigeru Miyamoto as their "ultimate development hero." And no, "Ultimate Development Hero" is not Activision's newest property. Just throwing that out there. A survey of over 9,000 (no, seriously) game developers from around the world by industry publication Develop asked them to name the industry figure that they considered to be their hero. A whopping 30% - that's about 3,000, for those doing the math at home - answered Shigeru Miyamoto, best known as the father of some of Nintendo's most timeless series, such as Mario and the Legend of Zelda. Really, is anybody surprised? Develop sure isn't. 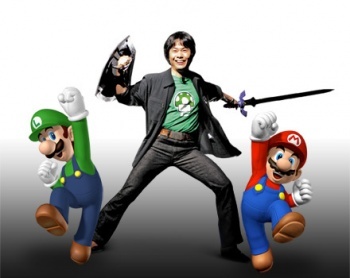 "It's no surprise that Miyamoto-san is the development hero of developers - over the last thirty years he has created games that have not only driven the evolution of the games industry but also changed people's lives," said Andy Lane, managing director of the Brighton, UK-based Develop conference. "He has mastered the art of developing titles that are innovative but never at the cost of gameplay: games that are ground breaking, yet still mass market." Following Miyamoto at #2 was John Carmack, the man who pioneered the FPS genre all but single-handedly. Maxis founder Will Wright, creator of SimWhatever, The Sims, and Spore took 3rd, while Briton Dave Jones - founder of Realtime Worlds, and creator of Lemmings and Grand Theft Auto placed fourth. Rounding out the top five was Sid Meier, creator of, well, the Sid Meier's Civilization series. Meier was the second person ever to be inducted into the Academy of Interactive Arts and Sciences' Hall of Fame - right after Shigeru Miyamoto. The rest of the top ten is hardly surprising, either: Peter Molyneux, the man who is the picture-perfect definition of "dream big," Elite and Tycoon series creator David Braben, PaRappa the Rapper father Masaya Matsuura, Blizzard pioneer Mike Morhaime, and indie darling Jonathan Blow.